My love for desserts has never deterred but my preferences has certainly changed and yearn for something unusual. Don’t get me wrong. I still love my chocolate but it has to be dark and not too sweet (unless I have a craving for sugar). I remembered recently reading the Wall Street Journal about (white) miso accented desserts and it’s one of those “why didn’t I think of that” moments since I adore and obsessed with salted caramel or anything sweet and salty in a dessert, it makes sense for miso and its fermentation adds an umami effect that bridges the sweet and salty. 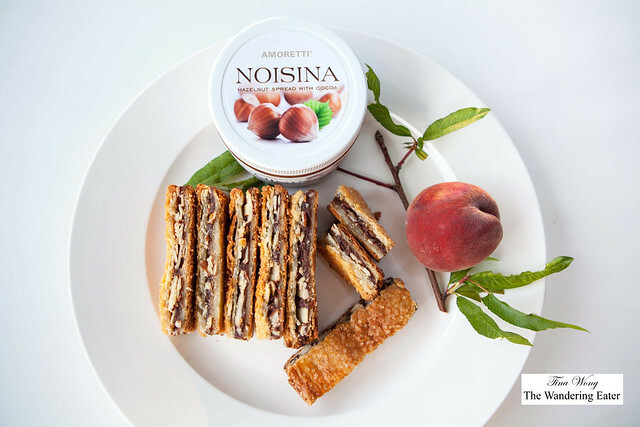 I had a jar of Amoretti Noisina Spread, a chocolate hazelnut spread that less sweeter version than the well known Nutella and I wanted to create a simple dessert for a dinner with friends at my home since I’m fussing over the main dishes. Since I had plenty of white miso (and marinating my pork tenderloin with it), I thought of throwing a few tablespoons into the warmed chocolate hazelnut spread and it tasted wonderful. The sweetness of the chocolate spread meets with the gentle saltiness of the miso and the slight fermented funk added a delicious edge to it. 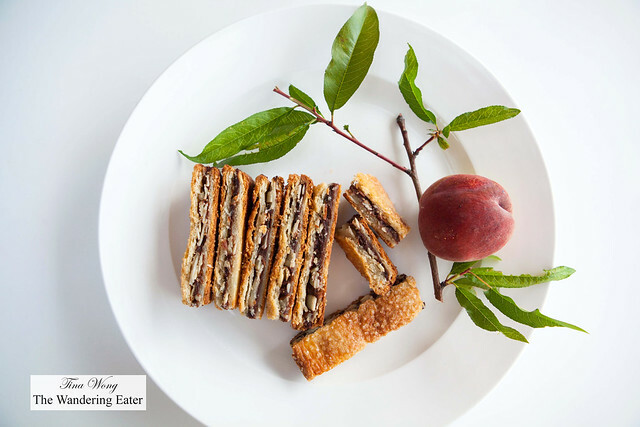 When it’s sandwiched between the buttery, crumbly rugelach cookie, it is hard to stop eating. This rugelach dough is very similar to most rugelach doughs but the recipe change is the ratio of butter to cream cheese so when you slice the cooled baked cookie, it will not fall apart under the pressure of your knife. 1. In a large mixing bowl, add the butter, cream cheese, and salt and start to blend them together with a rubber spatula. You may use your stand mixer bowl and the mixer fitted with a paddle attachment and start mixing it on a low speed until the cream cheese is broken down but butter is still chunky. On low speed, add flour and salt, and mix until crumbly and just beginning to hold together, about 20 seconds. There should still be some small pieces of butter visible. Divide dough into two equal parts. Form each part into a flattened rectangle, and wrap in plastic wrap. Transfer to the refrigerator to chill 5 hours or overnight. 2. After chilling the dough, preheat oven to 375°F. Remove the dough from the refrigerator and set aside. Take a medium sized mixing bowl and add the chocolate hazelnut spread and warm it in the microwave for 30 seconds. Add the miso paste into the chocolate spread and whisk it until fully blended. Set aside. In a separate small bowl, add the egg yolk and water and beat it until combined. Set aside. 3. Prepare a 9×13-inch baking pan lined with parchment paper. 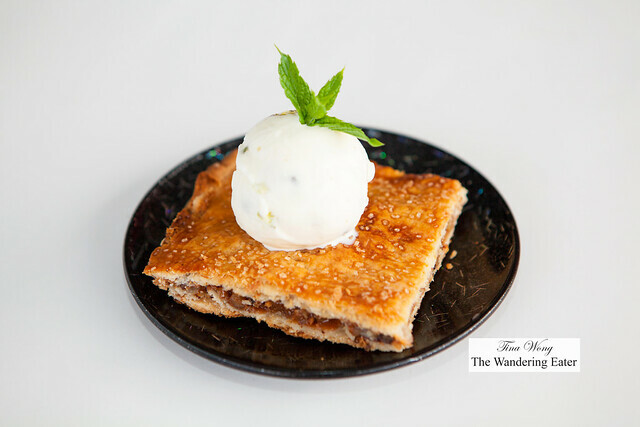 Place a rectangle of dough between two 9×13-inch pieces of waxed paper and roll the dough into a rectangle the size of the baking pan. Line prepared baking pan with dough. Spread dough evenly with the miso chocolate spread and sprinkle the flaked almonds evenly. 4. Roll the remaining rectangle of dough into a rectangle the size of the baking pan and place on top. Trim the edges of the dough so they are even. Brush the top of dough with egg yolk mixture, and sprinkle with sugar. Bake until golden, about 30 minutes, rotating halfway through. Cool on a wire rack. Cut into 50 to 60 rectangles, approximately 2 1/2 by 3/4 inches. You may have variations with fillings. Since I was on a salty-sweet run, I had some insanely delicious cajeta (by Fat Toad Farm) and sprinkled Maldon sea salt liberally (about 1 1/2 teaspoons) on the spread layer of cajeta with dried currants and the flaked almonds. Then add the rolled out layer of dough on top and bake until golden brown. Please note: this particular rugelach will stick to the pan as it’s bubbling and baking away, so be sure to line your baking pan in parchment paper. 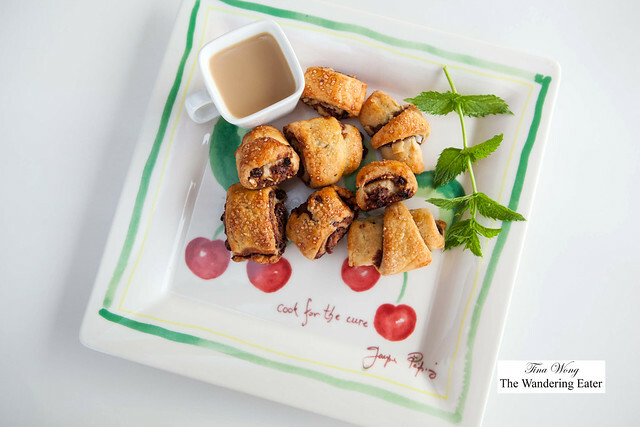 wow these bars look delicious… you can never go wrong with chocolate, hazelnuts and nutella. interesting idea using miso, i almost did a double take reading the recipe! definitely need to try this recipe out.. thanks for sharing!